Both Venus and Regina formulas work effectively together for maximum and fast tightening effects. Vaginal rejuvenation without surgery. 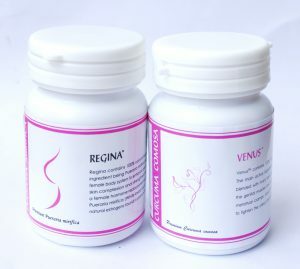 Venus and Regina are highly recommended in perimenopause and menopause. Both herbs formula work together perfectly. Direction: Daily dose of 1-2 capsules of each together in the morning and 1-2 capsules of each in the evening. Both herbs can be consumed together with the Best Vaginal Tightening results : fast and strong effects. An additional cost of $50 on regular air mail.